I have always dreamed of being in New York City during Fashion Week, little did I know that my dream would one day become a reality. When Lucky Magazine sent me an invite to come to their FABB conference I knew I could not turn it down. Since I officially registered one question has constantly been running through my mind. What do I wear?? I have always played dress up in my mind when I dreamt about being in NYC during Fashion Week, but this is no longer a dress rehearsal. This will be the real thing! I know I want to wear a dress or skirt and I want to wear something a little dressy but yet still relaxed and comfortable. So I headed over to my favorite site to shop- shopbop.com and did a little "shopping". Of course which each dress I'll style it up with blazer, heels, accessories, etc. 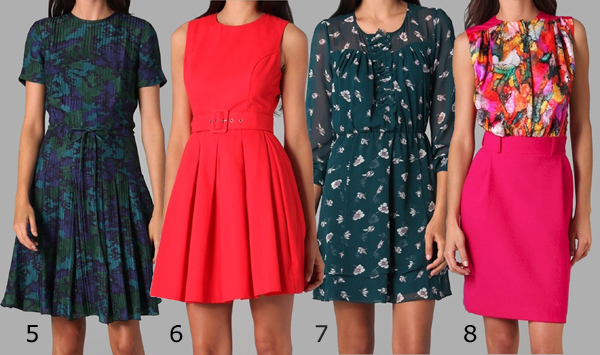 So tell me which dress is your favorite! PS-Have you entered my Shabby Apple Giveaway yet? ENTER HERE! I like 6, 7, and 12. Have you checked out Modcloth? They have some great dresses.